Bare conditionals, I argue, exhibit Conditional Duality in that when they appear in downward entailing environments they differ from bare conditionals elsewhere in having existential rather than universal force. Two recalcitrant phenomena are shown to find a new explanation under this thesis: bare conditionals under only, and bare conditionals in the scope of negative nominal quantifiers, or what has come to be known as Higginbotham’s puzzle. I also consider how bare conditionals behave when embedded under negation, arguing that such conditionals often involve denial negation. One important conclusion that emerges from the discussion is that an account of bare conditionals that validates Conditional Excluded Middle is not warranted. By limiting the scope of the (variably) strict analysis Conditional Duality is also a way of maintaining such an account. 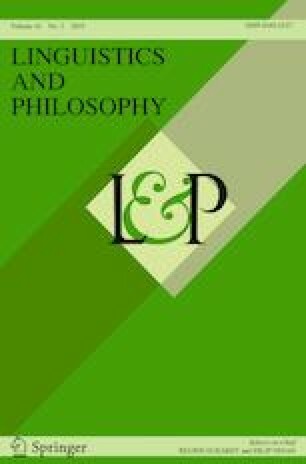 For very helpful questions and comments I would like to thank two anonymous reviewers for Linguistics and Philosophy, and also Sam Alxatib, Wayne Davis, Larry Horn, Paul Portner, Aynat Rubinstein, Barry Schein, and Benjamin Spector, who commented on an earlier version at aworkshop in honor of Martin Prinzhorn in Vienna in November 2017. Parts of this paper were also presented at the Conditionals at a Cross-Roads Workshop (University of Konstanz, November 2016), the New Research in Modality Workshop (Georgetown University, May 2016), at the 25th Semantics and Linguistic Theory Conference (Stanford, May 2015) and at the 19th Sinn und Bedeutung Conference (Göttingen University, September 2014). I am grateful to the audiences there for their insightful questions. All remaining mistakes are my own.